US hotels motels and International hotels motels and lodging accommodations are quickly and easily searched via hotelmotelNOW.com. We make it easy for you to find your ideal hotel by sorting our 85,000 hotels worldwide by price range. So save a tremendous amount of time and energy by narrowing your search to hotels within your desired budget right from the start. Using our proprietary visual search technology is as easy as 1,2, 3 and completely intuitive. We start this search by displaying hotels on area maps and then allow sorting by "Hot Rate" discount hotels, price range, or chain name. Only US hotels meeting those criteria are displayed. This is not only a tremendous time saver but allows you to immediately eliminate hotels outside your area of interest. Click #1 : Click on a state . . .
Click #2 : Click on a city . . .
Large cities are shown via blue dots on the State map. If your intended city is not shown on the state map, don't worry. We show smaller cities down the left border. Just click on the city name to see hotels listed in that city. For larger cities, you'll see the hotels in your chosen city depicted visually on area maps via blue or red dots. Red dots signify hotels with "Hot Rate Specials". You'll see the hotels' location within the city with the interstates used as points of reference. Hotels with "Hot Rate Specials"
Click #3 : Click on the blue or red dot . .
You are immediately sent to the "Brochure" or "Overview" page of one of the hotels within hotelmotelNOW, or to the hotel's own Web site. Nearby information such as restaurants, golf, tourist attractions, recreation, etc. 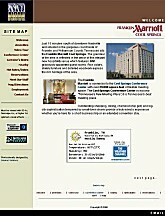 Other city-specific hotel websites include nashvilleNOW.com, factsNOW.com and musiccityLIVE.com.